Pets single-highhandedly make your days brighter with their unconditional love and attention towards you. So it is extremely important that you treat them with warm love and dedication as well and make their lives a more worthy one. There are a lot of products on the market that are crafted to make your pet’s life more loving and the dog bath tubs are certainly one of the most amazing inventions of recent times. Though dogs are meant to hate bathing times, however, if you have a dog bathtub at your home, bathing them will become a much easier and friendlier procedure. But how will you decide which model suits you and your furry friend? This is where we come in. 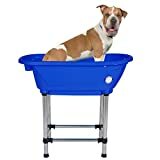 The best dog bathtubs that have reliable and durable features dedicated to making the bathing an easier process altogether are listed for you. 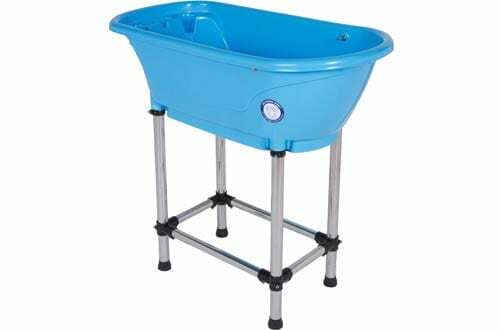 Give your pet a tender touch of love and care by bathing them in this elevated bathtub from Booster Bath. It comes with 2 piece quick-snap tub and quick snap-legs for added benefits. You also get the advantage of a 19 inch high legs that makes the tub stand at 32.25 inches after set up. Furthermore, the U entrance makes it easier to place your pet in the tub. The drain hose on the tub helps in proper draining procedure and keeps you dry all the while. 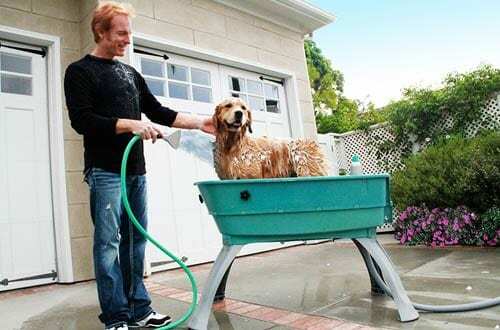 For pets weighing less than 125 lbs, this bathtub will keep your bathroom and back clean. Comfortable and struggle free bathing. The Flying Pig bathtub is certainly a great choice to make for your pet. The lightweight of the tub, a huge capacity of 150 pounds and set-up dimensions measuring 37.5” X 19.5” X 35.5” makes bathing your mischievous friends much easier. Moreover, you get a heavy-duty plastic construction that ensures durability while the stainless steel legs make it stable and reliable. You can also set up in uneven areas as it comes with a lever that can do wonders for any type of floor. Perfect for medium to small sized pets. 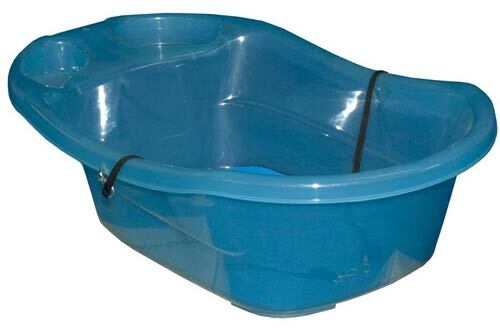 This is one of the durable dog bathtubs in the market that has won the trust of veterinarians and handlers. 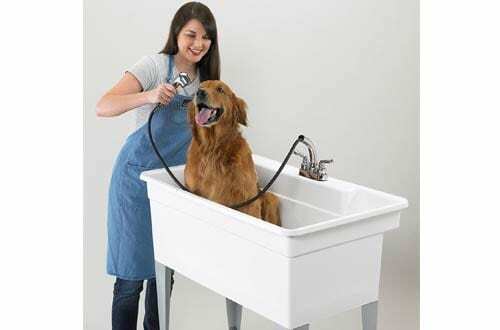 The elevated design makes it makes it an ideal bathing solution for your furry friends and with 360-degree access, bathing has never been mere easy. It comes with a standout feature of a three-point restraint system combined with quick-snap removable collar allows the pet face towards the tub and stops it from writhing or jumping around. Use it inside your home or set it up outdoors without any challenge as this bathtub is meant to serve you in an amazing way. Other handy features include a drain hose for easy drainage and dedicated shampoo pocket. 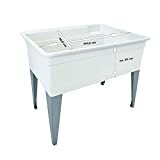 A bathtub dedicated for large dogs and pets, the X- Large bathtub from the trustworthy brand of Booster Bath measures a huge 50” X 21” X 15”. From now on you don’t have to hurt your back while bathing your pet as the elevated design adds to your comfort. It features 19” legs that raise it to a total of 32.25 inches after assembling and comes with a 25 inch U entrance that enhances the accessibility impressively. 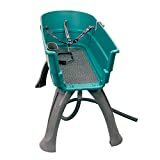 The huge 175 lbs weight carrying capacity is perfect for bathing of large dogs without any challenges. The rubber bumpers help in making it sturdy and stable and the no-slip mat eliminates any chances of slipping off your dog. Drain hose for easy drainage. Designed to deliver unmatched performances and comfort while you bathe your pet, this cleverly designed bathtub for medium to small sized pets is undoubtedly a reliable product. 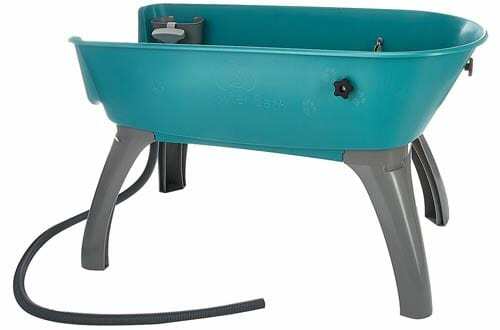 The heavy-duty plastic construction of the basin ensures the durability of the dog bathtub. Also, you get the legs that are made of stainless steel which will serve you and your pet for long years without any risks of rusting due to water. Besides, it comes with a leveller so that you can even put it up on uneven floors. Being lightweight, it can be used for both indoors and outdoors without any hassles. Withstand a maximum weight of 150 pounds. 360-degree access adding to the manoeuvrability. 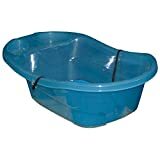 This model of pet bathtub is undoubtedly one of the strongest as it is constructed out of heavy-duty solid 16 gauge 304 stainless steel that ensures protection against any kind of rusting and corrosion. The total height of this tub measures 57 inches making it an ideal choice for medium to large dogs. Furthermore, in this bathtub, you get a central drainage system that requires no extra need for plumbing whatsoever. The leg levellers aid in proper height adjustment and also make it easier to be stable on uneven grounds. 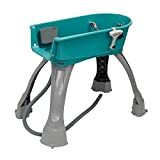 The bathtub comes with a rubber floor mat, hose for both faucet and sprayer, shampoo rack and even restraint eyelets. Removable backsplash as well as side splashes. Can carry weight up to 220lbs. 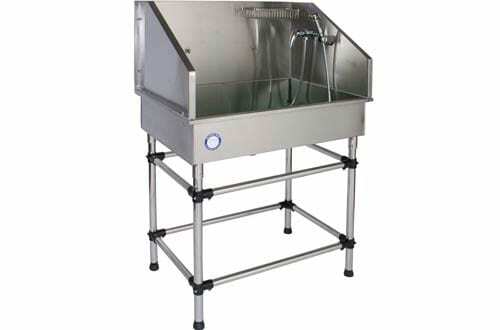 The Pet Gear is the only model on the list that is dedicated towards bathing of pups. At the bottom, you get a rubberized finish that prevents slipping of your pup while the two tethers on either side secure the pup during bathing. Often pups suffer from anxiety and to reduce the stress, the tub is constructed out of see-through plastic allowing them to see the outside world thereby reducing added stress. Also, to make it easier for you, it features two storage racks for shampoo and a quick drain to help you keep dry even when you bathe your pup. The addition of the rubberized grippers eradicates chance of slipping away from the tub as well. A weight carrying capacity of 20 pounds. The trust and reliability of the Flying pig Grooming brand have been brought forward with yet another amazing pet bathtub for your loving and adorable pets. 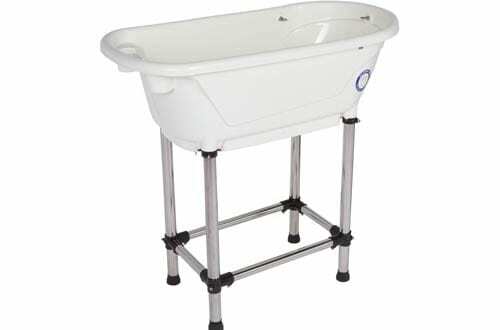 They deserve to be nurtured with care and these bathtubs have been specifically designed to deliver them comforting bathing sessions. This model is mainly for medium to small sized dogs having weights up to 150 pounds at most. 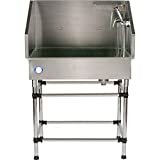 The heavy-duty plastic construction of the basin adds to the durability factor impressively and even comes with stainless steel legs that give it a stable. Moreover, in this bathtub, you get the advantage of 360-degree access. Being light in weight, carrying it around the house or backyard is not a problem at all. Undoubtedly it is designed keeping the modern needs in mind. Fits in any standard bathtubs. Standing at a maximum weight capacity of 150 pounds, this Fly Pig grooming model is meant to reward your pets with incomparable bathing experience altogether. 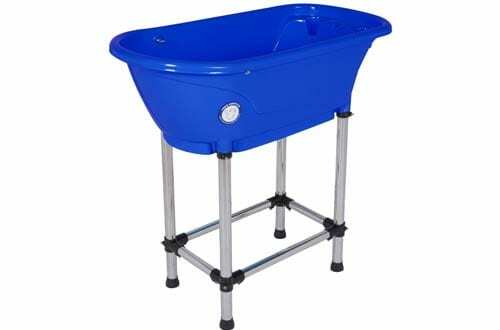 Primarily, the basin is constructed out of heavy-duty plastic materials that save it from corrosion, rusting, etc and even assures durability. The legs are made of stainless steel and come with levellers to stabilize it even on uneven floors. Along with that, you get 360-degree access on this tub, which makes it easier for you every time you decide to give your pet a bath. Medium to small sized pets including dogs and cats. The drain hose is connected for easy draining. The plastic is UV protected. At the top of the list, the Mustee Big Tub is certainly the most amazing model of bathtub available in the market. This model ensures durability and features one of the strongest constructions that are made out of impact resistant polypropylene in a single piece moulded design. In addition to that, it features heavy-gauge steel legs that are meant to last and has levellers for uneven floors as well. 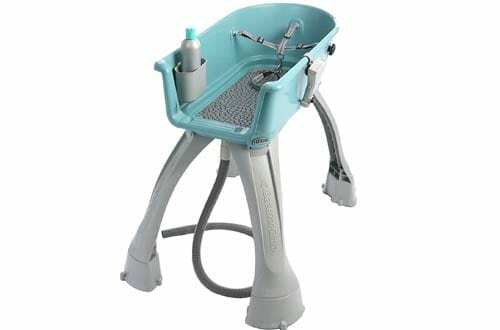 The presence of the swivel faucet combined with a long 24-inches pull out spout makes bathing procedure an easier one. It also has integrated leak-proof drain that comes with a stopper to enhance the bathing process. This also has dedicated lever handles for better performances. Mildew, stains as well as mould resistant. Maximum capacity of 36 gallons. An ideal choice for medium to large size dogs. Each product comes with attractive features that are meant to deliver optimal performances and comfort when comes to bathing your pets.